After Windows dropped the bombshell to Nokia that none of their devices would be compatible with Windows 8, it was back to the Nokia Labs to begin making a new model that would be compatible, since then we’ve heard rumours of a Lumia 1000, Lumia 1100, Lumia 990, but it seems Nokia are going for ‘Lumia 920′. Windows 8 has gained a lot of attention at IFA 2012 and has overshadowed the lack of Android phones and tablets on offer. It is truly Windows’ fall, so let’s hope they make the best out of it before the iPhone 5 arrives. 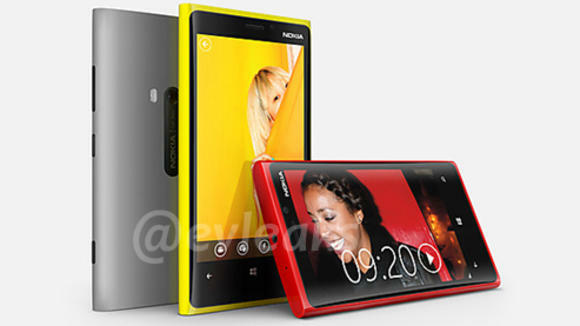 The image, posted by@evleaksshows the Lumia 920 in a range of different powerful colours: red, yellow and grey. The image also shows the PureView camera that has been rumoured for a while now, ever since Nokia added the huge megapixel camera to its range. We believe the device has a 4.5-inch display and comes back with Nokia’s customised square look, to fit with Windows metro look. The Nokia Lumia 920 will come alongside the Lumia 820, which apparently is a successor of the Lumia 800; we expect these both to arrive at the same time. Even though we know nothing on the insides of the new Nokia range, it is certain they will be running Windows 8 phone. Nokia are holding an event next week, perhaps to clarify about all the recent rumours surrounding the new Nokia range. While Nokia may not be the headline company at the moment, there new line of smartphones may push Windows 8 as a mobile operating system.